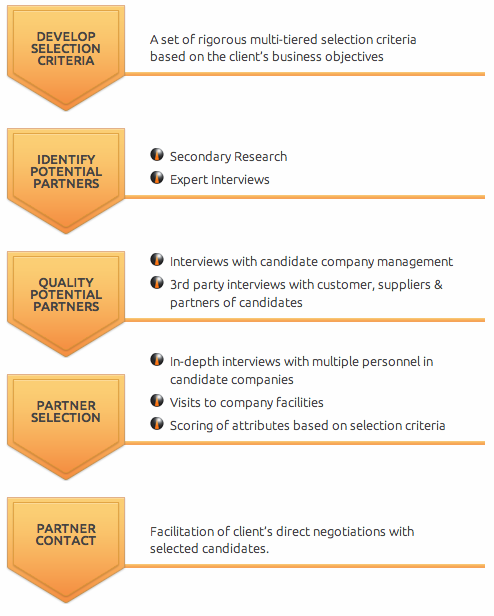 Forging sustainable “business marriages” is the aim of Spire’s business partner evaluation service. We shortlist and evaluate firms that can truly add value to your company. Candidates are rigorously assessed through company interviews and on-site observations, which are validated against third party opinions and secondary research. We provide solutions for various partnership needs, including joint ventures, mergers and acquisitions (M&A) as well as sourcing for distributors, retailers, suppliers, service providers or franchisees. Spire also offers consultancy on defining best practices in securing and maintaining business partner relationships across countries.